NEW YORK (Reuters) - It's the holiday season and Arianna Huffington, the influential woman behind the popular news website that bears her name, is busy buying sweaters - some 700 of them - as gifts to her employees. From brands like J.Crew and White + Warren, the sweaters are placed at the desks of The Huffington Post staffers who can swap or trade them before posing for an annual group photo. When The Huffington Post was sold for $315 million nearly three years ago, Huffington told her new boss, AOL Inc Chief Executive Tim Armstrong, that they had to uphold the tradition she started when she launched the site in 2005 and personally selected sweaters for her handful of employees. By the time of the February 2011 takeover, The Huffington Post had 200 employees and was known as a leading source for left-leaning political news. "I told Tim when we discussed the acquisition the one thing, however big we are, we are able to give sweaters," Huffington, 63, said in an interview early in December. With AOL's backing - it has injected tens of millions of dollars into the website - The Huffington Post has been able to do much more than give out cardigans every year. Its audience has more than tripled from 25 million people before the AOL deal to 84 million at the end of October, according to comScore data. It has branched out to cover lifestyle, entertainment, business and technology, mushrooming to 60 vertical sites from about 20. But The Huffington Post has yet to turn a profit for AOL, falling far short of Armstrong's projection at the time of the acquisition that the unit would post $66 million in operating profit in 2013 on $165 million in revenue. While that has not hurt AOL's share price this year - the stock is up more than 40 percent - analysts said The Huffington Post will become more critical next year to AOL's hoped-for transformation into a digital media powerhouse. 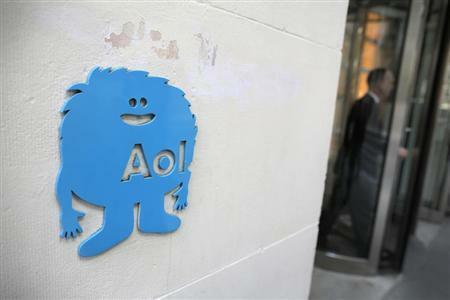 Macquarie analyst Ben Schachter said investors gave AOL's content businesses a pass this year because its dial-up Internet subscriber business - where it made its name almost two decades ago - declined at a slower-than-expected rate. Investors were also happy with a special dividend and stock buyback from AOL's $1 billion patent sale to Microsoft Corp.
"Going forward, things like The Huffington Post and the overall Brand Group will have to show they are real businesses and profitable," Schachter said. "I've been a broken record about it: Can they make content profitably? Up until recently the answer has been 'no.'" The Brand Group, which includes The Huffington Post, TechCrunch, Moviefone and Patch, reported an adjusted operating income before depreciation and amortization (OIBDA) of $4.6 million for the nine months ending in September. For the same period in 2012, it reported a loss of $41.6 million. AOL does not break out results for the individual sites. Mark May, an analyst with CitiGroup Research, forecast The Huffington Post will post a loss of about $6 million this year on $100 million in revenue. AOL executives say The Huffington Post is losing money because they made a deliberate decision to divert advertising revenue back into the business to help it grow, and that the website would be profitable otherwise. Armstrong, in an interview, said The Huffington Post's loss is narrowing and he expects the business to turn profitable next year, helped by the growth of global editions, video, and lifestyle conferences. He declined to give specific figures. "Huffington Post has come to the point where it's a non-replicable asset," Armstrong, 42, said. "It would take a lot of effort and a lot of money and lot of years to repeat what we have been able to build with them." After Huffington and Armstrong shook hands on the takeover at the 2011 Super Bowl in Dallas, the latter justified the hefty price tag - roughly 6.3 times 2011 estimated revenue - by saying The Huffington Post would become the cornerstone of AOL's media aspirations. But the merger has had rocky moments, in part because of tensions between Armstrong and Huffington, who was put in charge of all of AOL's editorial content. Their strained relationship had to do with culture clashes, differences over the allocation of resources and how the other brands would mesh with The Huffington Post, according to several people familiar with the situation. Last year, Armstrong considered ousting or sidelining Huffington, according to two people with knowledge of the matter, who spoke on condition of anonymity. It is unclear if Armstrong formally presented those scenarios to the board. Armstrong and Huffington both acknowledged there were bumps in the early days of their partnership, but denied that there was a plan to fire Huffington. "Tim and I have a great relationship. The first year, when we worked out a lot of things, it had its hard moments," Huffington said. "If you look at The Huffington Post's growth and innovation it's staggering. It would not have happened without Tim." Armstrong told Reuters, "I have gone to the board in support of Arianna to get resources. She's doing a great job and I respect the work she is doing." Instead of replacing Huffington, Armstrong restructured the business as part of a wider reorganization of AOL. Huffington's title did not change - she was still president and editor-in-chief of The Huffington Post - but she lost oversight of the other AOL editorial brands in April 2012. Later that year, The Huffington Post was given its own chief executive, Jimmy Maymann, who was previously in charge of AOL's international properties. He reported to Huffington but had operational oversight, including building out a sales team. Maymann told Reuters that the changes meant The Huffington Post could operate like a start-up within a larger organization. It was still part of the Brand Group, but it had its own budget, technical resources and dedicated sales staff that will grow to about 40 people from a handful previously. "The Huffington Post has now got the keys to the car," said Maymann, who had joined AOL after it bought his video distribution company, Goviral, in January 2011. "AOL is still in the car, they are just in the back seat, whereas for a little bit of time there was some confusion (over) who was driving. That has made the relationship a much better one and a much healthier one," he said in an interview. The restructuring came as The Huffington Post faced growing competition from other new-media start-ups, such as Buzzfeed. Buzzfeed has become one of the fast-growing U.S. media sites - it now employs 300 people and is profitable, according to its founder and CEO Jonah Peretti, who also helped start The Huffington Post. In explaining the restructuring, Armstrong said, "There were a lot of areas AOL wasn't moving fast enough in and was slowing The Huffington Post down." 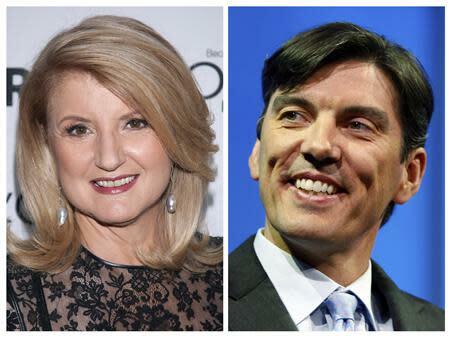 AOL executives are betting on international sales to increase profits at The Huffington Post next year. 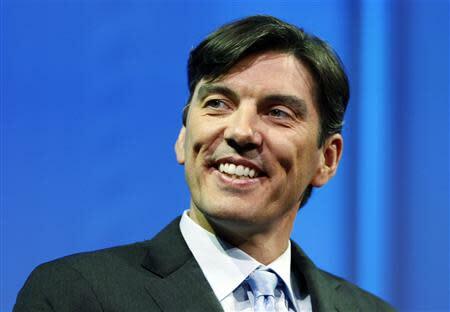 AOL bankrolled the site's expansion in France, Japan and northwest Africa, and it plans to be in Brazil, India and other countries that collectively generate almost 50 percent of the world's gross domestic product (GDP) by the end of 2014. Maymann said the site decided to partner with foreign media properties, which take about a 25 percent cut in advertising sales, to defray costs and to increase traffic. By the end of next year, executives expect half of The Huffington Post's traffic to come from outside the United States. AOL has also invested millions of dollars to install professional TV studios to broadcast HuffPost Live, an effort described as the first cable channel on the Web. It combines real-time shows with audience feedback through online comments. Programming runs the spectrum from an interview with U.S. Secretary of Health and Human Services Kathleen Sebelius to "Sexercise 101." Armstrong said the live programming can garner tens of thousands to hundreds of thousands of viewers, while millions of people tend to view the programs on demand. Still, a deal to carry HuffPost Live content on cable through a partnership with Mark Cuban's AXS TV is stalled. The Huffington Post also closed its Los Angeles studio to redirect resources internationally to cover events such as the World Economic Forum's annual meeting in Davos, Switzerland. "We are continuing investments in video and international," Armstrong said. The Huffington Post "has very strong prospects to have a global profitable business as we go through 2014."